These are WONDERFUL! I really love the bed. I'm going to have a closer look at the mess. 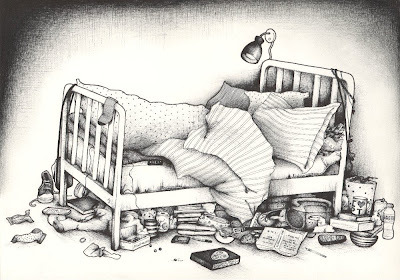 I love drawings of mess. I have a teenager that is 100% boghouse rat - and he doesn't even have an alarm clock! 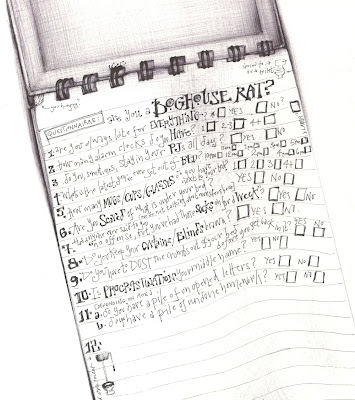 (I see the questionaire only went up to 6pm...) Great sketches Andrea - Tracy Emin's bed was boring compared to this! I love everything about it, the drawing, the mess and mostly the atmosphere and emotion both the text and the image stir up together. Oh God, that's what has happened to me in my dotage? With no job calling to me, I loll in bed, dress at noon or later, and have more cups with tea stains than I can count. I don't tolerate much dust, but my sweater, sweatpants and socks (All worn day after day)are covered in cat hair. I am becoming a boghouse rat! Enough. Your drawings are brilliant. As usual. nope, that's not me! :) I'm a bit of a neat freak. I love the term though... what is a boghouse anyway??? This is where you belong, making stories out of the the things you do, you have a lucky niece. I'm STILL waiting for that wonderful book that is in there waiting to creep out. Hey, i'm from Russia.I only wanted to tell, that your drawings are really wonderfull!!!! Thank you so much! Oh wow. I love it. I look forward to seeing it available as a print. cI am the worst boghouse rat I know! I fight against it all the time! 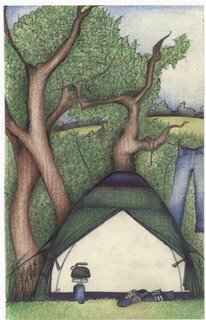 I do love the humour and imagination in your work Andrea - and your brilliant use of the common or garden biro. BTW thanks for visiting my blog! I can never just look at your work once. It has that comebackandhaveanotherlookability about it (is that a word?) So I came back and still love it, worry that I may never touch a brush again after seeing it, and smile at the little bowl and spoon that keeps making appearances. I failed the boghouse rat test by the way, tempted to copy your pic into Photoshop and airbrush under your bed OMG I have OCD! I wish I had an aunt like you ... so talented AND so much fun to be with! that bed is a mess, but looks very cozy to take a nap. your attention to details really shows how much you love to draw! Hahahaha...somehow I doubt you are quite the boghouse rat you pretend to be! Sounds like the peeeerrrrfect way to spend a weekend. Even your lettering fascinates me. I must admit that I have grown out of being a boghouse rat. Or so I like to think, although when I look around at this chair - the cups, pencils, pens, Jafa Cake wrapper - it makes me wonder. It's just nice to sink into it for a weekend every now and again. And, of course, Sherry, if I have the day off I never dress until noon. Micah, a boghouse is an out door toilet. I think Boghouse Rat originates from Liverpool - it's a Scouse expression. Although it was used in a childrens tv programme some time ago, too. Rita, I like your style! I like to believe there's a bit of a boghouse rat in all of us. And, I like the idea that maybe I've spread the boghouse name across the pond, across the world even. Boghouse rats of the world unite and take over. What a fabulous mess we'd be in then. Every time I visit your blog, I am in awe of the amazing gift you have been given. Your artwork is just incredible! Boosh! Excellent choice. I TOTALLY have a pile of unopened letters (I leave the boring ones like statements for ages), and I have 2 glasses next to my bed, although I haven't got up at 2pm since I was a student. Honest. I was staying at my other half's house this week without him and I watched the clutter accumulate. I'd been using his car as well, and he returned from his first trip afterwards saying "I assume you no longer need this KFC straw?" Great post, Andrea. Love the bed. Thanks everyone. I am very comforted to find that there are many more boghouse rats out there. Of both sexes and all ages. Thank you ALL, guys. Glad you liked it. I LOVE your messy bed! It's so, uh, charming. The notepad drawing is a true work of skill and endurance. Great stuff, Andrea! I am the quintessential boghouse(or boghoose seeing as I'm Scottish)rat,as is my lovely,scruffy wife. Love your stuff,it has inspired me to take up drawing again after far too long a time.